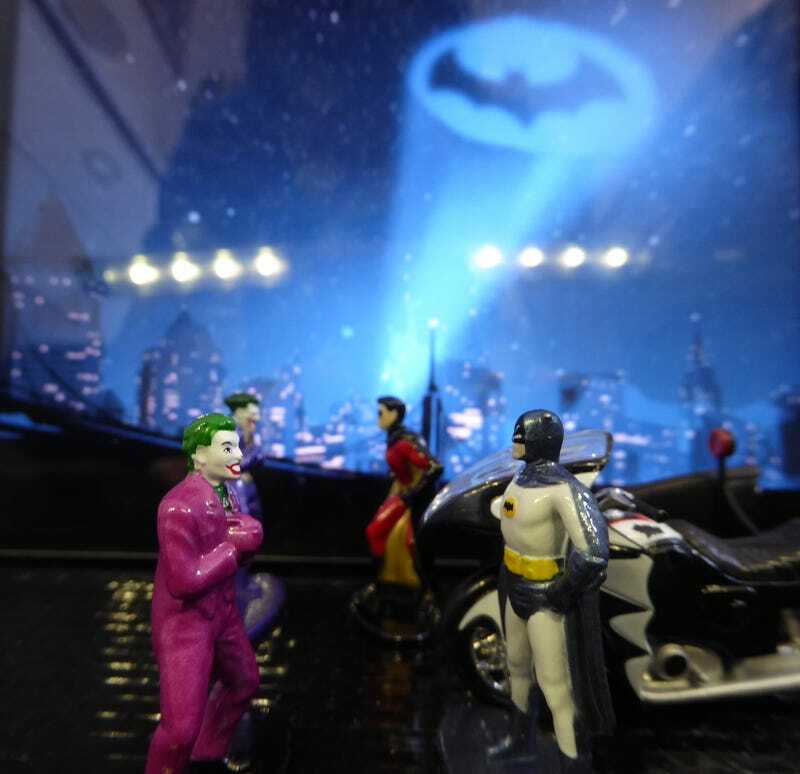 Batman is face to face with the Joker and so is Robin. Robin: Holy shrinkage Batman. Looks like micro figurines of us. Batman: You mean ‘Nano’ Robin as these are the newest merchandise called Nano Metal Figs from Jadatoys that gave you JDM Tuners, Just Trucks, Metals Die cast and more. And these are 100% die cast and that qualifies for it to be posted on LaLD. Robin: Right and if you’ve been searching for figures to complement your Bat collections, these are sure to fill the gap and they are around 2 inches tall. Narrator: Ahem. Forgive me for interrupting but you were given a mission. Batman: Right you are. (Then turning to Robin) Robin do you see what I see? Robin: Holy double trouble Batman. We are looking at not just one but 2 Jokers. Joker 1 (right): Ha, ha, ha, right you are boy wonder. I am the Joker from Batman: The animated series while Joker over here err... let me just call him Joker 2 is from the 60's Batman TV series. Joker 2: Ha, ha, ha indeed he’s right. I am from the 60's TV series. (Turns to Joker 1) However since my show came first before yours, I should actually be Joker 1. Joker 1: Well I spoke first so I will be Joker 1. (Turns to Robin) And you Robin although you are with Batman of the 60's TV series, you are not from that series but may in fact be from the animated series just like me. Robin: Is this true Batman? Batman: It’s true that you are not based from the 60's Robin but are as good as the 60's Robin. Robin: Thanks Batman. Should we take care of these Jokers? Batman: Right you are Robin. Joker 2: Joker 1, I think we should head for the hills. Joker 1: Nonsense Joker 2. Since there are 2 of us, we have twice the number of bag of tricks to finish the dynamic duo once and for all. Batwoman: Not if I can help it. Joker 1 and Joker 2 (trembling): We’re doom! Narrator: And so the Jokers are put behind bars and Gotham city is safe once again. And if you missed the previous Bat blog, check out the 1/24 Batmobile. End Music: Nananananana… (drum played) Batman.